These are robust herbs, generally terrestrial with thick stems (the larger flowered species of the Wiehler genus Pentadenia). Columnea trollii is found in this section. 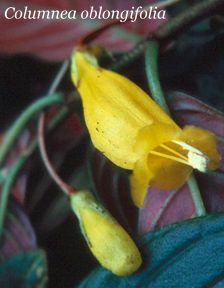 The plants are larger in stature than most other species of Columnea with erect stems, a characteristic generally unusual for this genus and more common to close relatives such as Glossoloma. 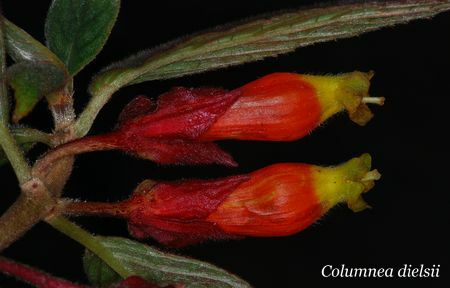 Interestingly, the fruits of Columnea trollii may also represent a transitional stage between the indehiscent (unsplitting) berry fruit of Columnea and the fleshy dehiscent (splitting open on maturity) fruits of Glossoloma and Drymonia. The fruits of this species are generally indehiscent, but sometimes on drying or with some pressure between the fingers, the fruits will split open on clean lines, possibly the same sutures that dehisce in close relatives. C. dielsii, recently transferred into Columnea from Alloplectus has a fruit that fully dehisces. Further work is needed to resolve the differences in fruit dehiscence between Columnea and its close relatives.